← The masismo over the years, have suffered democratic defeats! 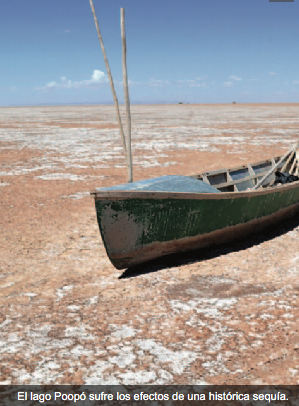 The communities affected by the drought of Lake Poopo raised alternative projects to the governor of Oruro, Victor Hugo Vásquez, and technicians. The lack of water in the second mirror of the country’s largest water affects a dozen peoples such as the Urus. “We propose to implement some alternative projects, such as micro-irrigation, greenhouses, drilling of wells and ponds”, he reported yesterday to the government agency ABI, Assemblyman Andrés Choque. He added that another approach was to build a “pond” from the island of Panza to Island Katawi to retain water in the lake. In all cases, the Government pledged to conduct studies to assess the feasibility of alternative projects . At the meeting, community members also requested that the technicians of the Department of Agriculture and Livestock Service made an inspection to identify areas where they can implement rescue projects for the Poopó. Choque announced that in the coming days, Civil Defense will held the second delivery of humanitarian aid to families living on the banks of Lake Poopo and that are affected by the drought at the water mirror. Climate change, the diversion of rivers, mining, among other factors have made the Poopó into a desert. The flora and fauna have disappeared with consequent environmental risk. One of the primordial lessons in sustainable development is to listen to the common sense of the affected people and react quickly. Current ochlocracy in power is more concerned with its illegitimate re-re-re-election than to remediate this environmental disaster! This entry was posted in Bolivia, Business, Economics, Environment, Health, Politics, Social Unrest and tagged demagogue, environmental damage, government failures, Oruro, polluted lake, public policy failures. Bookmark the permalink.